For a long time I’ve been trying to find out what one of the shrubs in my garden is. I’ve trawled through books and made assumptions and been wrong every time. The main reason its been so difficult for me to identify this shrub is, that is has never flowered as long as I’ve had this plant, so I was trying to identify it by its leaves only. Not an easy task for someone as ignorant about plants as I am. I suspect the reason it has not flowered is that it was stuck in a very dark corner between the Willow tree and a Banana tree and received absolutely no light, never mind sun. It was in a very dark, deep shaded area. In December we were forced to remove the massive banana tree (it was causing structural damage to a wall) and now that this shrub has been getting light again it has almost doubled in size in the last two months. But still no flowers. Yesterday I happened across some old gardening notes I had that says this shrub that I love so much is called “Asystasia Bella“. I googled it and found very little information and even fewer photographs that convinced me that this is indeed my shrub. Quite by chance this morning I did some more googling to discover that it is Asystasia Bella, but better known as Mackaya Bella (Forest Bell Bush), family Acanthaceae. I then found this page with two photographs of Makhaya Bella under cultivation at Kirstenbosch Botanical Gardens. Yay!! I’ve finally identified my shrub. Now how can I get mine to flower like the one in the second photograph? Mackaya bella is a beautiful shrub or small tree with slender branches bearing dark green leaves. The leaves are simple and oppositely arranged. Small, hairy pockets are often found in the axil of the veins. It has beautiful, large and attractive mauve to white flowers in terminal racemes usually marked with fine purple-pink lines. The genus Mackaya was named after James Townsend Mackay, author of Flora Hibernica. There is only one species in the genus Mackaya. The genus Mackaya was once included in the genus Asystasia. Its specific name bella means “beautiful”, a tribute to its large bell shaped flowers. The forest bell bush occurs naturally in the Eastern Cape, Kwazulu Natal, Swaziland and Northern Province in evergreen forest, often along the edges of stream. This plant occurs nowhere else in the world except in Southern Africa which means is endemic to this region. Mackaya bella is commercially available in almost any local nursery in South Africa. It makes a stunning display if planted in a pot and can also serve for screening in a semi-shade area. The river bell is a desirable garden plant, which thrives in shade but flowers best with more sun, although this may cause leaves to yellow. The wood was once used to kindle fire by friction. The beautiful Blue Pansy butterfly caterpillars (Precis oenone oenone) feed on this shrub. 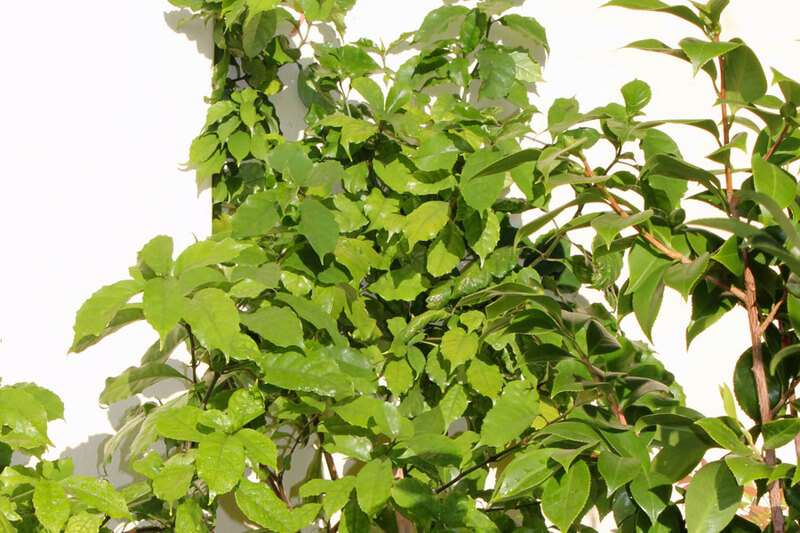 Gowing Mackaya bella: Growing Mackaya bella is easy from semi-hardwood stem cuttings taken during spring and autumn. Plants can also be propagated from seeds. Cutting materials may be treated with root stimulating hormone and should be planted in washed river sand. Rooting can be hastened by keeping the cuttings in a misted bed. 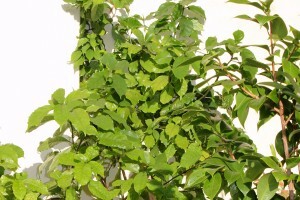 In the garden forest bell bush should be planted in well-drained soil, with plenty of compost. Water well in summer, but less frequently in winter. To encourage bushiness plants should be pruned often. Mackaya bella is frost tender and it is advisable to plant it in a protected spot in cold regions. If is frosted, it should be drastically pruned to encourage new growth from the base. 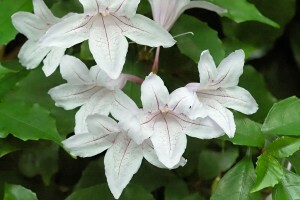 Mackaya bella performs best in sub-tropical to temperate regions. This fast-growing shrub thrives when planted near water or in light shade under trees. Ideal for gardens both large and small. Use it as an ornamental in a large container on a shady patio-don’t forget to water and feed it regularly, or it will not prospur. Perfect for the shady south side of a building, or use to decorate a shady entrance area. Suitable for use as a low but pretty screening plant. Mackaya perfers light fertile well-drained soil, such as good loam, with plenty of compost added. Mulch heavily—-remember that this is a forest-loving creature that enjoys its home comforts–with lots of leafmould and humus! Water well in summer but little in winter. Feed with slow release 3:1:5 fertiliser (low in phosphorus) at intervals of 6-8 weeks throughout summer. Pinch out the growing tips of young plants to encourage bushiness. Prune to shape and neaten when necessary. Use the prunings as mulch. Thanks so much for the info!! I will try the leafmould (have plenty!) and will get humus. I’ve been fertilising with something else – the same stuff the Camelias get – I think that may be the mistake. I have noticed the profilic growth that occurs after pinching! Its a gorgeous plant – I’ll follow this advice and post the results here! I am also a newbie gardener…………. I haven’t done that yet – I will do that next (soil ph requirements). If you are a newbie gardener you should join the site http://www.blotanical.com. So many gardeners, newbie to pro on that site and they are friendly and helpful! Its like a social network for gardeners! Let me know if you join so we can connect there too. Ani, do you have a blog we can visit? Cool……I will join for sure……this is my new passion and 1st June am moving into a new place with a small garden…….so will be starting the garden from scratch…..never landscaped before! Oh wow! You’re very close by to me. Tokai is lovely and starting a new garden is LOTS of fun (and work) but very rewarding! That’s going to be a gorgeous bush when it flowers !! With your loving care it will just flourish, I’m sure! Do you recognise it? Remind me to show you next time. I really love this shrub. It will flower. Beautiful plant. Mine are desperately trying to survive, but yours look lush and happy. The flowers are big and look amazing when they come. Oh thats great news Diana!! Is there anything special I should do to help them flower? I read compost and acid fertiliser? I hope you can get it flowering. That is beautiful. Bella!